These cheeky kit additions offer endless combinations of interesting and inspiring new sounds which would make a strong addition to most set-ups. Well-made, versatile gear that won't break the bank. Meinl has been at the forefront of shaping the 'modern' drum sounds that we've become so familiar with in recent years. Producing some of the driest and darkest sounds around, the German company has also released FX accessories which promise to further augment any drummer's set-up. 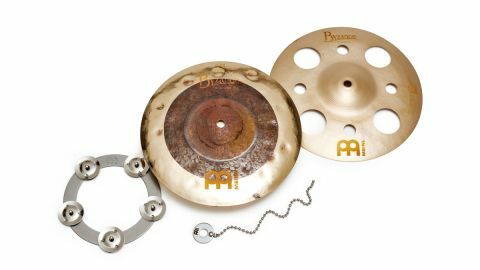 Today we're looking at the Byzance Extra Dry Dual and Byzance Vintage Trash Splashes, the Meinl Ching Ring and the comically named Cymbal Bacon sizzle chain. The Dual splash is completely unlathed in the centre whilst the outer 11.5" area shows off a brilliant finish. A number of broad hand-hammering marks are clear to see which, considering the small size of the cymbal, should dry the sound considerably. The Vintage Series Trash Splash features four enormous circular cut-outs and four smaller ones, evenly spaced around the bow. What is left of the surface is sandblasted which leaves it with that distinct golden patina. The steel Ching Ring is perfectly sized to sit snugly around the bell of most cymbals and features five tambourine jingles, attached with rivets. The Cymbal Bacon doesn't differ much from sizzle chains that we've seen before except for the rather smart, branded steel-mounting disk to which the chain is riveted. As suggested by the names, both splashes are dry and trashy in nature. The sandblasted Trash Splash is the shorter of the two and has more of a glassy quality. The Dual Splash had a little more warmth but was ultimately short and cutting. Where both cymbals come into their own is when used within stacks. Simply placing one of these over a regular crash completely transforms the timbre and opens us up to an endless number of applications. The additional metallic quality that is offered by the Ching Ring results in drying out my hi-hat sound slightly and helps it cut more rather than just adding a generic tambourine layer. It does however come through in abundance when stepping the hi-hat. We had lots of fun experimenting with rides and crashes, and achieved amazing results adding it to cymbal stacks. The Cymbal Bacon is perfectly weighted for a clean and lengthy decay.